Most moderately educated, self-respecting Indians would have grown up learning (or mugging up, because of our stellar education system!) about the icon that is Lakshmibai, Rani of Jhansi. She was a real-life superhero, at par with or even above her fellow soldiers in the struggle for freedom. Countless little girls (including yours truly) have dressed up as her for fancy dress competitions. 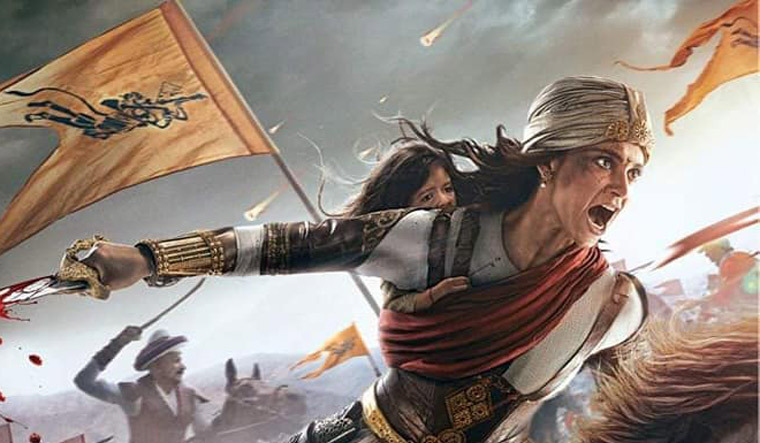 There were several hiccups associated with the production of Manikarnika—Queen of Jhansi, with Sonu Sood walking out at the last minute, Kangana Ranaut having to step in as director, and the Karni Sena throwing tantrums now and then, but now, six decades after her first appearance in Sohrab Modi’s Jhansi ki Rani, this warrior queen graces our screens again. The plot follows the story that we all know—that of the widowed queen taking up arms against the British and unleashing a world of pain on the foes that dared underestimate a woman on the throne. The movie opens with a 14-year-old Manikarnika (Ranaut) of Bithoor fulfilling her role of friendly neighbourhood tiger tranquilliser. She catches the eye of Jhansi’s top official, as she rides off into the wide-open plains with her sari flowing perfectly horizontally in the wind. Did I mention she was 14? A leap of time (and barely any difference in outward appearance) shows her being the unconventional queen of Jhansi, refusing to bow to the British and meting out retribution to those who oppressed her people. During the course of her short existence, she defied roles of traditional widowhood, strode masterfully down hallways with her adopted son at her hip, and rammed her sword into the brains of several men. Most of all, you want to cheer for Manikarnika through all of this—even when her eyes are open so wide that you could see the back of her skull if it weren’t for her thick eyelash extensions! Ranaut is undoubtedly magnificent as the titular character. She brings a righteous anger and otherworldly fury to the character, who is mostly portrayed as perfect to such a level that it blurs the line between reality and fantasy. Manikarnika flexes her stunt training for a good chunk of the first half, sometimes leaping and back-flipping across unnecessary distances that she could just as easily have walked to. One half expects her to yell Parkour (Office style) after every fantastical jump. However, Ranaut plays Manikarnika with such conviction that one does not even pay attention to the weak script that makes her force-feed the audience with long expositions drowning in patriotic fervour. If it seems like this review is dwelling on Ranaut for too long, that is because the film is structured in exactly the same way. There was hardly a scene where she was not present, and the host of supporting characters seem present only to make Manikarnika seem more glorious in contrast. If that was the purpose, Manikarnika—Queen of Jhansi has certainly worked out. The British officers (led by Richard Keep) are reduced to mere caricatures, thirsting for Indian blood at every opportunity, while loads more could have been done with other characters like those portrayed by Danny Denzongpa and Ankita Lokhande (in her film debut). There was an obstinate refusal to depart from the torturous Indian custom of foreign actors insistently speaking mangled Hindi, and several otherwise important characters like Tatya Tope and Maharaja Gangadhar Rao are tragically passed over with too little screen time to develop. Though not to the level of a Bhansali piece, the cinematography for Manikarnika—Queen of Jhansi by Sachin Krishn is definitely stunning, a welcome contrast to the inconsistent CGI applied through the film. In particular, there is one extra battle scene where everything moves in slow motion, from multiple angles that would do Ekta Kapoor proud. Indeed, some of the gory battle sequences makes one wonder about the U/A certification given by the Censor Board. Music-wise, Shankar-Ehsaan-Loy deliver on the score yet again, although it cannot be ranked among their top 5 for sure. The costume design by Neeta Lulla has given us some gorgeous pieces, especially for Ranaut. Admittedly,this reviewer's hopes for Manikarnika—Queen of Jhansi were not high after that rather soap opera-esque trailer. Thankfully, the reviewer was not entirely disappointed, although Manikarnika—Queen of Jhansi leaves a lot of scope for improvement. Ranaut certainly manages to don the role of our antar aatma ki aawaz, and has certainly made a praiseworthy effort in her directorial debut. All in all, if you are looking for a quick fix of patriotism on the occasion of Republic Day—complete with gau raksha and everything—Manikarnika is the movie for you.